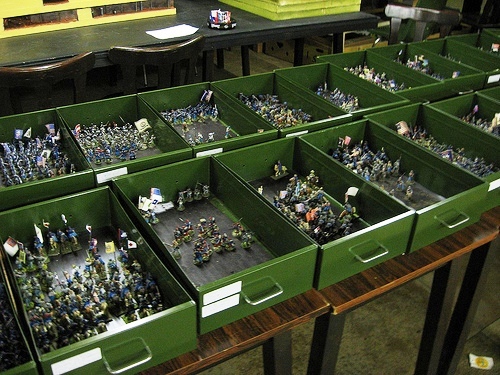 The Tin Soldiers of Antwerp is a long-time miniature wargaming club in Antwerp, Belgium. 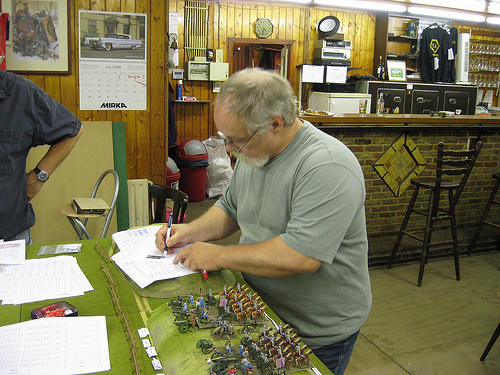 In my last post, I showed a few photos and gave a link to Patrick Roover‘s photos of a 28mm Gettysburg wargame that used various scenarios from my Enduring Valor: Gettysburg in Miniature scenario books. These games were organized and GM’ed at TSOA by Andre Van Gils, who was kind enough to e-mail me and send some details on the game. Note the impressive clubhouse and the huge gaming layout! 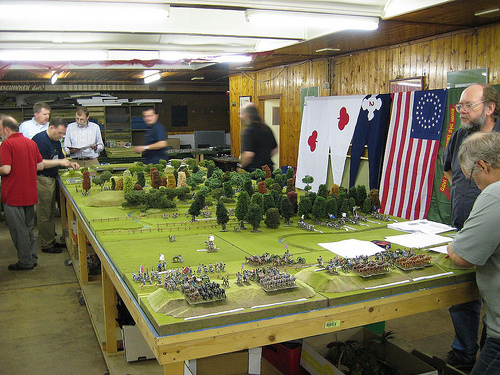 The twin tables used for this scenario are a whopping 12 feet by 18 feet in dimension, and there is still plenty of room for the gamers to mingle on the sides, as can be seen from the above photograph. 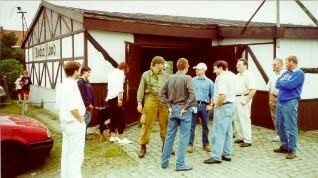 Note the ACW flags on the hardwood paneled wall! With plenty of close-in parking and a large interior space, this is one of the most impressive gaming clubs I have seen, and perhaps on my next trip to Belgium I will find the time to stop by and say hello. Organized games are held every Friday night, and at other times as schedules allow. The city of Antwerp is a fun place to visit, and now I have even more reason to do so! The club members even have the luxury of a separate storage room in the back for all that terrain and other goodies that are not in use at the moment! Now, where was that box of extra Virginia worm fencing? 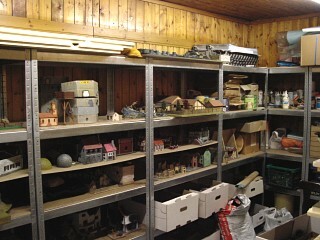 Now that we have taken a virtual mini-tour of Tin Soldiers of Antwerp, what about your gaming venue? Any photographs to share with the Charge readership? Do you have a maintained, dedicated facility for your gaming action?